This day long workshop turned out to be quite useful and I was impressed by how well organized it was. I’d be happy to share more details with anyone who might be interested. 2nd session: “Worth a Thousand Words. Letting Pictures Speak” A very interesting and useful session. The idea is to get a group of students in a room and provide each of them with large pieces of paper and various markers/pens/pencils, then ask them to draw their ideal classroom, study space, lounge, whatever. Emphasizing that there’s no right answer and that they’re designing their own personal ideal. Allow them time to brainstorm visually on their own, then go around the room and ask them to describe their drawing. This exercise brings out common themes as well as unique ideas. Notes are taken and a list of desired elements compiled. We each drew our ideal classroom and then went around the room and looked at everyone else’s drawing. I can imagine actually trying this here at Middlebury LIS. 3rd session: “Getting the Most out of Your Data: Methods for Collection, Coding and Use for Implementing Change in Student Learning Spaces” The most useful session of the day for me. Basically they shared how they made use of the great quantity of data that is to be found within the comments fields of surveys. Using a list of “codes” they categorize various comments and then use a spreadsheet to organize them by code. The organized lists can then be shared with appropriate staff,(for instance those who oversee printing, reference services, the café, etc.) for further evaluation. I emailed the presenters and they willingly shared their list of 100 codes. Key take away- they hired student assistants to go through all the comments and code them because they, just like us, don’t have the time to do it themselves. Here’s the PowerPoint. 4th session: “Resurrecting Elihu Burritt Library: The Challenges and Opportunities of Rehabbing Library Space” The presenters gave an overview of a recent renovation project and talked about future plans. Not particularly applicable to me or Middlebury. 5th session: “Space Project Plans Writ Small” We used a retro style game from a diner place mat (literally, the kind of thing that kids would get to fill out in a restaurant in the 60s and 70s) as a tool to get user input into the kind of space they’d like. It’s the kind of thing you have to see to understand and an example of it can be seen in the ppt from the 3rd session. I’m not sure what to think of this tool, but if we had an artist who could draw something similar, it might be interesting to give something like it a try with a group of student assistants. The day ended with the very capable facilitator Susanna Cowan, Undergraduate Education Team Leader at Univ. of Conn., leading us in a review of the day. Thanks to Hans Raum for pointing this workshop out to me! This entry was posted in LIS Staff Interest and tagged conferences, Facilities on May 14, 2012 by Joseph Watson. Come Monday May 17 the LIS Technology Helpdesk will be relocating from LIB135 to LIB125. Our actual move of Helpdesk functions will begin Friday May 14 at 3:00pm. While the Helpdesk functions are being relocated to LIB125 the Helpdesk Student Consultants located at our Walk-In Helpdesk Center in LIB202 will be open for business to receive calls and process problems. The staff during the relocation will be engaged in the move. There should be minimal impact to our users during this move and we are confident that we will be back in full operation late Monday morning May 17. Thank you in advance for your patience and understanding during this transition time. This entry was posted in LIS Staff Interest and tagged Facilities, Helpdesk, lis staff, User Services on May 14, 2010 by James Beauchemin. In the interest of sharing this much anticipated plan with everyone as soon as possible, below please see the LIS Staff Relocation Plan that LIS Administration approved this afternoon. It’s a working document, not a formal one, so please excuse any name abbreviations or spelling errors. It shows where LIS staff will be located on three floors of the Davis Family Library. In the coming days we will work with Facilities Services to turn this plan into a move schedule and we will share that schedule widely as soon as possible. As you know, we are undertaking these moves as soon as possible because the College needs us to vacate the 2nd floor of Voter Hall so that it can be turned into student housing before students arrive for the fall semester. Thanks to everyone who worked with their managers to help draft the plan, and thanks especially to those who were given few, if any options because our options were generally very limited. Having said that however, I believe that many of the location changes will be improvements in the long run. Thanks for your continued patience and forbearance. Stay tuned…. and here it is…. This entry was posted in LIS Staff Interest and tagged Areas and Workgroups, Facilities, lis staff, Middlebury on May 6, 2010 by Joseph Watson. ADA access to Main Lib Storrs Ave door for the general public. Starting on Monday, November 1st, LIS will begin accepting applications from the general public who require ADA access to the Storrs Ave. doors at the Main Library. We are doing this because experts have determined that our current mode of access may not be in compliance with the Americans with Disabilities Act. Members of the public who do not have a relationship with the College may ask for an application at the Main Lib Circulation Desk. Applications will be accepted at the Circ Desk and forwarded to LIS Administration for processing. In order to qualify for access, applicants must show proof of having received a Disabled Persons placard or car registration from a state government. Qualified applicants will be issued an access card that will allow them to enter and exit the Storrs Ave. doors when the library is open to the public. This is only for guests of the college. Students who need such access apply to the ADA office and faculty/staff apply to HR. Staff will continue to let individuals in or out of the Storrs Ave doors on an as needed basis, but now regular users of the library who qualify will have the option of entering and exiting themselves without assistance from staff. Doreen, Elin, and Joseph have been working with Facilities Services and Public Safety on the details of the arrangements for several months. While the solution that is being implemented is flawed, it is none-the-less something we must do. We do not expect there to be a significant number of qualified people receiving access cards. There is a brochure at the Info Desk with general ADA info in it. Anyone who routinely encounters library users should take a minute to review that information. This entry was posted in LIS Staff Interest and tagged borrowing, Facilities on October 30, 2009 by Joseph Watson. 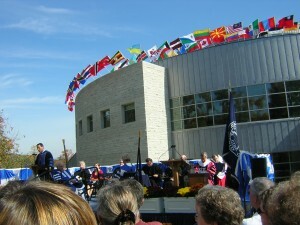 Five years ago this week the College community gathered on the front lawn of the Main Library to officially dedicate the new building. We were fortunate to have perfect weather for the event. It was a great day, full of music, dance, speeches, food, etc. The Main Library is a remarkable success. It has greatly enhanced the academic mission of the College by bringing together services that were scattered around campus. It’s clear the students love the place and we compete with the dining halls (yes, with food!) as the place to meet up with friends. Students spend many hours individually and in groups learning, studying, viewing media, and working on projects of all kinds. The Main Library has become the heart of the campus for many students who never knew Starr Library when it was anything other than a tag at the end of the name of the Axinn Center. An overview of the history of the project can be found here. To take a walk down memory lane check out this press release. This entry was posted in LIS Staff Interest and tagged anniversary, ceremony, dedication, Facilities, library, Main Library on October 7, 2009 by Joseph Watson. The Undergraduate Research Office (URO) has moved! The Undergraduate Research Office (URO) has moved! It is now located in Library 215. Pat Manley of the Geology department is the Associate Dean for Undergraduate Research and Colleen Converse is the administrative assistant for the URO. The URO supports and promotes undergraduate opportunities in inquiry-, creativity-, and experience-based scholarship through research experiences with Middlebury College faculty and other non-Middlebury professionals. Its mission is to integrate undergraduates more fully into the research life of the College. By relocating to the Library, the URO will now be able to collaborate more readily with the staff of LIS and, especially, of the Center for Teaching, Learning, and Research. Please feel free to drop in and introduce yourself. Colleen is in the office every day from 11:30 a.m. to 1:30 p.m. and her extension is 3026. This entry was posted in LIS Staff Interest and tagged Facilities, Sept 11 2009, URO on September 14, 2009 by Doreen Bernier. The person who some day invents a completely reliable high volume printer will make a fortune. Until then, we all know that printers sometimes break down and go off line. Communicating printer status to our users has been a challenge and we hope this recently installed “printer status board” will help. 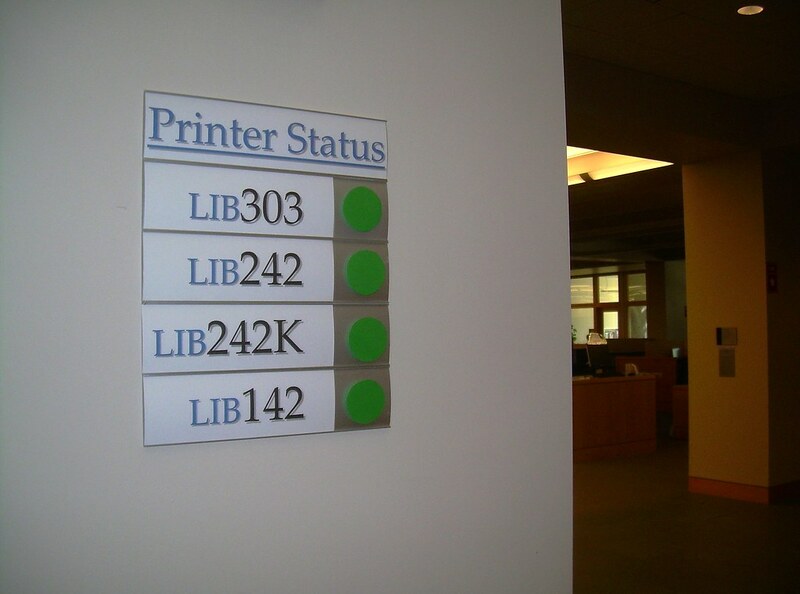 The Helpdesk will simply change out the green dots for red ones when a printer goes off line. The sign is in a high profile location in the Atrium of the Main Library and we expect that our users will grow accustomed to noticing it. Joseph Watson came up with the brainstorm and was able to use spare signs and left over scraps to put it together, so it cost nothing to implement. A similar sign will be installed at the Armstrong Library soon. This entry was posted in LIS Staff Interest and tagged Facilities, Sep 1 09 on September 1, 2009 by Joseph Watson. Charles Gwathmey, of the design firm Gwathmey Siegel & Associates Architects, died on Monday, August 3. GSAA designed our new main library. Mr. Gwathmey was present at the dedication of the library in October 2004, and spoke that weekend as part of the Clifford Symposium on October 9, 2004, sharing many of his personal concepts and ideas that led to the design of our wonderful facility. With colleagues at GSAA who worked closely with us in the early part of this decade, we offer our sympathy and mourn this loss. This entry was posted in LIS Staff Interest and tagged August 14 2009, Facilities, library, LIS Administration on August 14, 2009 by Jeffrey Rehbach.